UV Self -Pigmented Gelcoat, Fibreglass, Owen Rowing, Isophthalic Marine Grade Resin. The Kayaks and Canoes are light weighted, stream lined and highly polished for smooth and fast paddling. 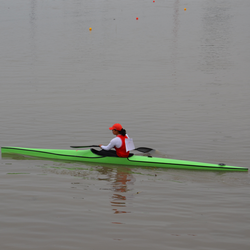 The boats have been specifically designed to provide a more comfortable and stable paddling platform while maintaining outstanding performance characteristics. 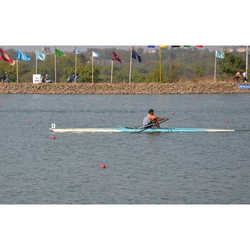 Our Kayaks and Canoes are user friendly and assist the paddler to have great performances. The banana boat is made out of high strength nylon fabric coated with hypalon / neoprene material to suit changes in the temperature. 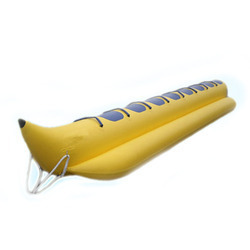 The banana boat is having three inflatable chambers; both the side tubes are giving enough stability during the operation. If one chamber gets punctured while in operation, the other chambers can withstand the load. Each chamber is fitted with strong non- return valves for inflation and deflation. The boat is provided with six nos of handles and seat pads. One heavy duty foot-pump supplied for inflation. A field repair kit is available for emergency repair. 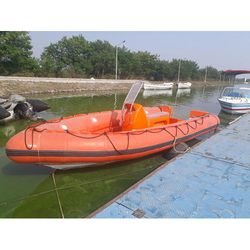 Manufactured out of marine grade Fibreglass and suitably complemented by high density rubberized (HYPALON) fabric, the boat is extremely stable and safe. As the name suggests, this boat is a combination of fiberglass and an inflatable collar around the upper part of fiber portion. It has got high speed due to its ‘V’ shaped fiberglass hull. The inflatable skirt all around the boat provides safety to the people and prevents injury to the person in the water as well. The FRP hull is filled with P.U. foam and thus unsinkable. The buoyancy chamber of the inflated rubber collar has five independent chambers so that in case of accident and damage to two or three chambers, the boat will still be serviceable with a full load. 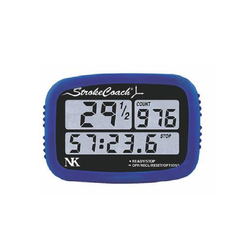 We are one of the leading manufacturers of optimum quality Stroke Coach. Due to their steady performance, user-friendly operations and longer functional life, these products are highly demanded in the market. Our team of logistics professionals assures timely delivery of the offered products at the customers’ end. The Model E Indoor Rower offers presence and durability with its 20-inch frame height and powder coat with a glossy finish. From a practical standpoint, the higher frame means easier on-and-off for those with tired knees or mobility considerations. One-piece leg design for both the front and rear legs results in stability and a sure, solid feel. A fully enclosed chain housing keeps the nickel plated chain clean. The Model E includes all the proven features of the Model D plus those listed here. Fishing Industry is a Foreign Exchange earner for the country and we plan to enter into this field in a big way to manufacture Fishing Boats in Fibreglass in place of traditional wooden boats. In fact, we have successfully developed a small fishing boat in Fibreglass ( FRP) suitable and affordable for small and medium fishermen for fishing purposes. We are into Fibreglass industry since last 24 years and we are sure that we could come out with a more innovative product for this segment which will be suitable for the Fisheries Department as well as for individuals, too which will be suitable for lakes, dams, rivers and even sea. We plan to manufacture an advanced version of Fishing Boat with the latest available composites and technology with Vacuum Resin system for attaining lightweight, more strength, more stiffness and more stability which will have an edge on the presently available boats/ equipment in the market. 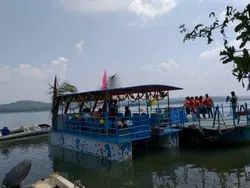 We initiated our firm Sunny Water Sports Products Private Limited in the year 1996 as a prominent name responsible for manufacturing, exporting and importing Water Sports Equipment and Tourist Boats. Offered range of boats is available in various models depending upon the needs & requirements of users. The entire designing process is performed after performing in-depth research procedures in context of market requisites and product configuration. 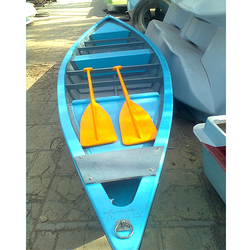 Under our product gamut, we have brought forward Kayaks - FRP& Carbon Kevlars, Rowing Shells - FRP & Carbon Kevlars and Training Boats to be used widely at centers of water sports, sanctuaries, parks and for recreational activities. It has been possible for us to bring forth unmatched quality of our offered range, backed by our vast infrastructural facility and expert engineers & other professionals. Our infrastructure is ultra-modern, sprawled over a wide area and equipped with all sorts of requisites, essential for carrying out designing & development of the offered range of kayaks and boats. Our team comprises personnel with skilled ideas and competent approach, leading us to become a trusted name in the specified domain. In the process, some of our products are imported from Europe & China, depending upon their demands in the market. As following & maintaining stringent quality protocols, we have become a global name. We are exporting our offerings to Asian Countries. We are here to make our customers satisfied and to offer them products as per their needs & expectations, under cost-effective budget.